The funeral of former Republic of Ireland international Liam Miller has begun. The requiem mass is taking place at the Church of St John the Baptist in Ovens, Co Cork. It will be followed by burial in the adjoining cemetery. The former Celtic and Manchester United player died on Friday at the age of 36 after suffering from cancer. Former Republic player and manager Steve Staunton attended the funeral, along with Roy Keane, Martin O’Neill and John O’Shea. Miller’s former Republic team-mates Kevin Doyle and Aiden McGeady also attended. Miller, who also counted Leeds and Sunderland among his clubs, had been diagnosed with pancreatic cancer. Miller grew up in Ovens, a village in County Cork, and although he played Gaelic football, his real passion was soccer, with a fondness for Celtic taken from his father Billy, a Scotsman from Motherwell. 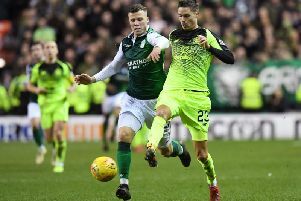 Celtic players wore black armbands in Mr Miller’s memory during their William Hill Scottish Cup match against Partick Thistle on Saturday. David Beckham and Wayne Rooney were among those who led the tributes to their former Manchester United team-mate. Beckham posted: “Our thoughts are with Liam’s family .. Rest In Peace”. Both played with the 36-year-old during his two-year spell at Old Trafford in the 2005/06 season and the club expressed their sympathy on Saturday. Manchester United players wore black armbands during the team’s Premier League clash at Newcastle on Sunday in memory of Miller. Republic manager O’Neill has described Miller as a “fantastic man”. Irish president Michael D Higgins said it was with great sadness that he had learned of the death of Miller, who brought skill and passion to his career in football at home and abroad. “In his too short life he contributed so much, from his making his professional debut in 2000 and earning his first cap for the Republic of Ireland in 2004, going on to play for clubs such as Cork City, Celtic, Manchester United and Hibernian,” Mr Higgins said. Ahead of the funeral Cork City manager John Caulfield encouraged the people of Cork to turn out in force as a show of support. Miller is survived by his wife Clare and his three children Kory, Leo and Belle.